Racing dog headed to the party! I was looking to make a birthday card and these newly acquired stamps from Fiskars caught my eye. I'm not sure what happened to the color in the photo but it looks better in person; it's a little off in the photo. Also impossible to see is the glitter added to the party hat and present, but it shows up somewhat on the banner. Simon Says Stamp Work It Wednesday Challenge: Cute. 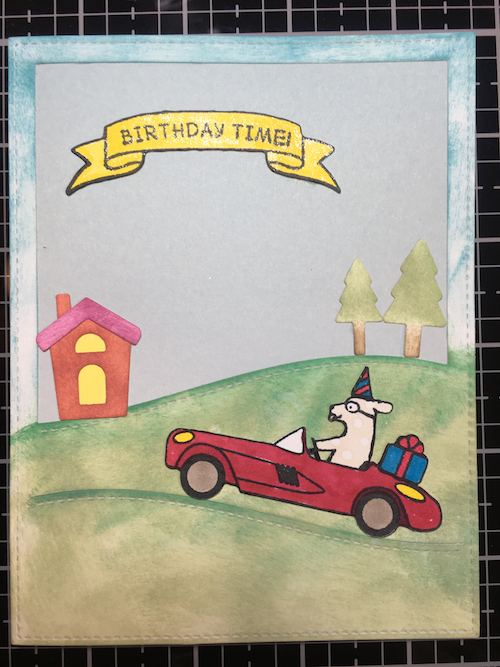 Use the Hillside Backdrop on white paper and run it through your die cutting machine. Ink up the main part of the backdrop with Distress Oxides in blue and green. Use various other colors for the tiny house and pine trees. Stamp your car image onto the alcohol marker white paper. Mask off the car and stamp the doggie onto it. Remove the mask and stamp the tiny birthday hat and present from Beam Me Up. Stamp out the banner and the sentiment on the same paper. Run both through your Brother machine or fussy cut with scissors. Color with markers, add glitter, and glue everything down. Done!